MCR Safety's new hearing protection line now includes cordedand uncorded disposable, high-vis-orange polyurethane ear plugs, and reusable,blue silicone ear plugs. All plugs are polybagged in pairs and sold by the fullcase. 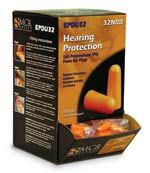 Reusable ear plugs are packaged in a case pack of 100 pairs per dispenserwith four dispenser boxes per case.